IQS Directory is a top industrial directory listing of leading industrial steel tubing manufacturers and suppliers. Access our comprehensive index to review and source steel tubing manufacturers with preview ads and detailed product descriptions. These steel tubing companies can design and engineer steel tubing to your specifications and application needs. A quick and easy to use request for quote form is provided for you to contact these steel tubing companies and suppliers. Each company has detailed profile information, locations, phone number, website links, product videos and product information defined. Read customer reviews and product specific news articles. We are the right resource for your information requirement whether its for square steel tubing, round steel tubing, or stainless steel tubing. As a leading steel service center in the United States, we can do it all. Whether you need steel tubing, high strength metal, or even carbon alloy steel, we can help! We have the tools and manufacturing capabilities to fulfill orders of any size. We are not only efficient, but we also place a high value on customer service. We always put the customer first in everything we do. Learn more when you contact us today! Steel tubes are hollow, cylindrical steel shapes used throughout industry, commerce and in consumer products contexts in a wide variety of applications. They can be used as railings, in ladders, as poles and even as support rods in exercise equipment. They can be used to support floating wooden or plastic docks on rivers and lakes. Steel tubes can be used in plumbing and electrical wiring applications, they can be shaped into furniture and they can be used to make mechanical parts. Fences, gates, lawn and garden equipment, playground equipment, trailer safety equipment, flu tubes, automobiles, conveyors, flag poles and farm equipment can all involve steel tubes of some kind. Steel tubing can be made to any specifications; shape, size and thickness are variable depending on the intended application of the tubing. Steel manufacturers can produce round, square, rectangular, oval or hexagonal tubing. An extensive variety of industries make use of tubing; these include the construction, automotive, electronics, shipbuilding, furniture, plumbing, aerospace and many other industries. In addition to all of the different steel tubing shapes and sizes, steel tubing can be made to varying specifications of thickness, corrosion resistance, heat resistance, strength and other physical properties. There are multiple types of steel tubing available. These include cold rolled steel tubing, galvanized steel tubing, hot rolled pickled and oiled steel tubing, electro-galvanized tubing, galvannealed steel tubing and several other varieties. Because of the wide variety of uses, each kind of steel tubing has its own unique attributes and ideal applications, and therefore each tube must meet tight specifications for its particular function. CNC machining, flaring, reductions, welding and brazing are some of the processes that can be used to form steel tubing. Steel tubing can be made in many ways; a wide variety of industrial processes are capable of creating tube shapes. Steel tubing can be made by the extrusion process, which involves melting the steel and forcing it through a specially shaped tool, which is called a die. 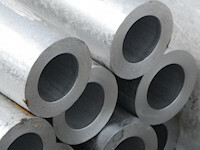 Extrusion requires a stock of raw steel that can easily be melted and shaped. In some cases, such heat-intensive processes are not feasible for steel shaping. In such cases, steel tubing can be formed by cold forming processes. A cold forming process is any metal forming process that does not involve heating the metal above its recrystallization temperature. Such processes decrease the risk of oxidation and can be less expensive than hot processes.